ECHO believes herbicides will affect the micro-organisms and ecology within the cemetery. has led authorities to involve the use of herbicides to stunt sprouting. They have resolved that the use of the chemical will be cost effective. However, locally based environmental organization ECHO (Environmental Community Health Organisation) is concerned about the environmental effects that the chemicals can have. ECHO expressed concern that the public has not been informed about the exact herbicides to be used and the likely effects on the environment. Executive member, Michael Vanderstoop noted in a correspondence to this newspaper that applying herbicides to a cemetery is not the same as spraying cane fields or agricultural areas. “The two situations are different; the micro-organisms and ecology of those two facilities are very different,” he pointed out. Further, spraying of herbicides to remove stumps and roots of trees, some of which are in some tombs, could have implications for the effectiveness of the complex and very necessary activities of those organisms within those tombs, the organization said. “What is the composition of the herbicides? What is the quantity of herbicides applied? These are vital questions, which in the normal course of things, should have been made public for information of all citizens,” Vanderstoop posited. It was reported that staffers from the Guyana Sugar Corporation (GuySuCo) have been contracted to apply herbicides in Le Repentir Cemetery, as part of the $100M project to clean the location. This publication was told that Caribbean Chemicals Limited is supplying the herbicides and an agronomist from the company, Martin Lopez, has been retained by the Ministry of Local Government to oversee the application. According to the report, Lopez believes that the use of the chemical will be more cost effective than hiring workers to clear the vegetation and to prevent its re-growth. Prison inmates and contract workers already cleared away much of the vegetation, but hundreds of tree stumps were deemed difficult to remove. Recently cut palm trees have also started to sprout again since many of the stumps were left behind. 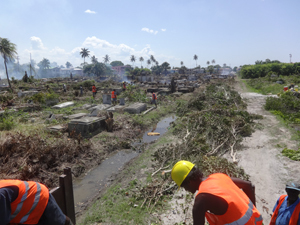 Minister of Local Government Norman Whittaker had told Kaieteur News that workers were forced to leave several tree stumps intact, since uprooting them would have resulted in erosion and damage to some tombs. However, Lopez said that the herbicides would cause the stumps to rot and they can eventually be removed without damaging tombs or causing erosion. In addition, he suggested that herbicides could be sprayed in the site occasionally to prevent the re-growth of unsightly vegetation. “This is much more cost-effective than trying to uproot the stumps (and running the risk of damaging the tombs),” Lopez said. With the rainy season approaching, this project will have to begin sooner rather than later, since new vegetation is already sprouting rapidly. In August, the Ministry of Local Government and Regional Development contracted the Guyana Prison Service and Jeffery Jones Construction to clean the cemetery. Under the $100M ‘Clean-Up My Country’ programme, the cemetery’s access roads were also slated for rehabilitation and drains to be de-silted. The Mayor and City Council (M&CC) which has responsibility for the city cemetery had previously expressed concern over the maintenance of the cemetery clearing project. The government had taken it upon themselves to clear the unsightly resting ground of the vegetation since the cash strapped City Council said they are financially unable to upkeep the location. They were concerned however, that tax dollars could be wasted, especially if within weeks of the clearing, the cemetery could be recovered in overgrowth. Deputy Mayor Patricia Chase-Green had told the media on several occasions that the Council is not aware of any maintenance program for the cemetery. She said that the City Engineer, who the Ministry involved in the clean-up programme, could not say what measures were in place to maintain the clearing that was done at Le Repentir Cemetery.